ESA’s Herschel space observatory has solved a long-standing mystery as to the origin of water in the upper atmosphere of Jupiter, finding conclusive evidence that it was delivered by the dramatic impact of comet Shoemaker-Levy 9 in July 1994. During the spectacular week-long collision, a string of 21 comet fragments pounded into the southern hemisphere of Jupiter, leaving dark scars in the planet’s atmosphere that persisted for several weeks. The remarkable event was the first direct observation of an extraterrestrial collision in the Solar System. It was followed worldwide by amateur and professional astronomers with many ground-based telescopes and the NASA/ESA Hubble Space Telescope. ESA’s Infrared Space Observatory was launched in 1995 and was the first to detect and study water in Jupiter’s upper atmosphere. It was widely speculated that comet Shoemaker-Levy 9 may have been the origin of this water, but direct proof was missing. Scientists were able to exclude an internal source, such as water rising from deeper within the planet’s atmosphere, because it is not possible for water vapour to pass through the ‘cold trap’ that separates the stratosphere from the visible cloud deck in the troposphere below. 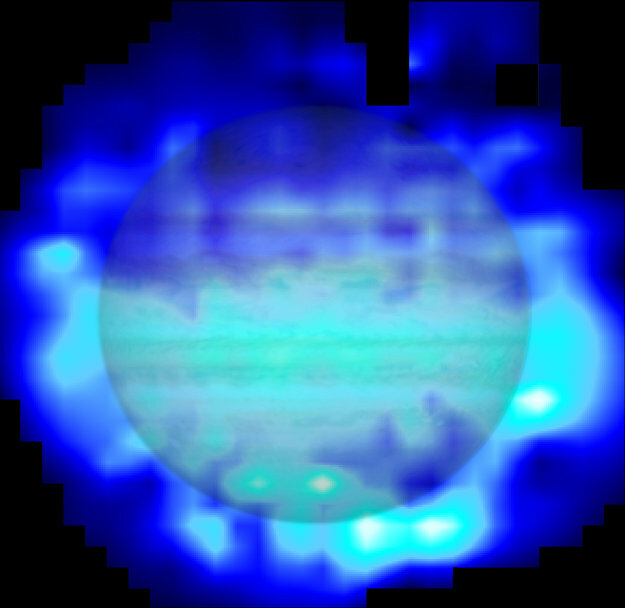 “Only Herschel was able to provide the sensitive spectral imaging needed to find the missing link between Jupiter’s water and the 1994 impact of comet Shoemaker-Levy 9,” says Thibault Cavalié of the Laboratoire d’Astrophysique de Bordeaux, lead author of the paper published in Astronomy and Astrophysics. Also, one of Jupiter’s icy moons could deliver water to the planet via a giant vapour torus, as Herschel has seen from Saturn’s moon Enceladus, but this too has been ruled out. None of Jupiter’s large moons is in the right place to deliver water to the locations observed. 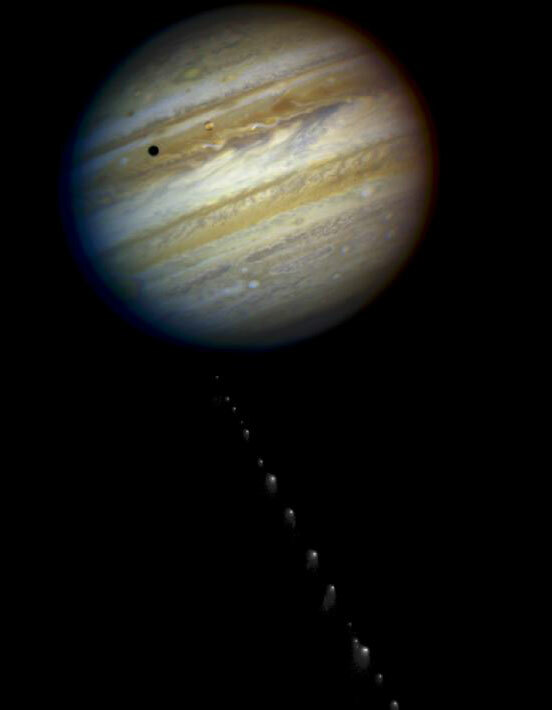 Comet Shoemaker-Levy 9 was discovered by astronomers Carolyn and Eugene M. Shoemaker and David Levy on March 24, 1993. It was the first comet observed to be orbiting a planet -- in this case, Jupiter -- rather than the sun. The effect of Jupiter's tidal forces had already torn the celestial body apart and, eventually, the fragments collided with Jupiter between July 16 and 22, 1994. The image of the comet, showing 21 fragments, was taken on May 17, 1994. 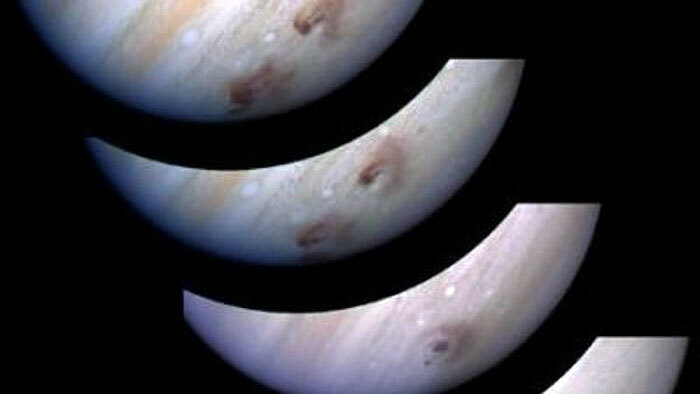 The image of Jupiter was taken on May 18, 1994. The dark spot on the planet is the shadow of the inner moon lo. The apparent angular size of Jupiter relative to the comet, and its angular separation from the comet when the images were taken, have been modified for illustration purposes.